The all new Turf Teq model 1305BC Brush Cutter features a 13-hp Honda engine and is self-propelled with a fully hydrostatic forward/reverse transmission. The machine also features an innovative industry-leading variable-angle cutting head, allowing the operator to cut under fences, trees and other difficult-to-mow areas. The deck pivots incrementally to the left up to one foot beyond the handlebars. The deck also has an adjustable cutting height. 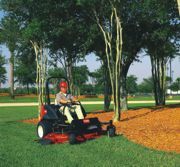 The model 1305BC also features a multi-use tractor with quick attach that can be converted to operate a Power Edger, Power Broom or Power Rake. Honda's HRC Commercial Series mowers consist of two models: the self-propelled, hydrostatic drive HRC216HXA and push-type HRC216PDA. The HRC Series' legendary mowing performance is enhanced by offering Honda's exclusive MicroCutTM twin-blade mulching technology. Twin blades produce finer clippings for mulching, and finer clippings mean less bagging. 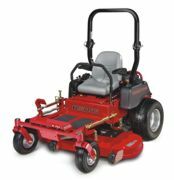 The HRC mowers are strong, fast, lightweight, more efficient and incorporate a number of key features. Earth & Turf LLC introduces light material sides for its MultiSpreadTM Model 320. With this convenient option the 1-cubic-yard topdresser virtually doubles its capacity when spreading light materials such as compost, calcine clay, etc. Maximum load capacity using the light material sides is 3,600 pounds. Especially great for spreading light compost to improve turf quality. Overall height with extension sides, plus narrow overall width, allows operator to reach in easily from either side if needed when loading. The extension sides are available for dealer or customer installation, shipped either separately or together with new machines. Excel Industries recently debuted Big Dog Mowers, a new product line of residential and commercial zero-turn mowers. 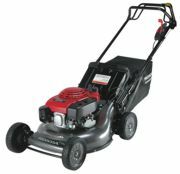 The X SeriesTM is a high-quality commercial line of mowers powered by Kohler and Kawasaki commercial V-twin engines with remote canister air cleaner and Briggs & Stratton ELS engines. Durable side discharge decks feature multiple reinforcements. Large 24-inch drive and 13-inch front caster tires provide a smooth ride, and optimal center of gravity provides superior balance. Get the job done fast with a top speed of 11 mph. ROPS comes standard on all X Series mowers. The Barber Turf Rake is a tractor-towed stone picker that removes stone from 1/2 inch to approximately 4 inches in diameter in one pass. The Turf Rake works to grade, remove and aerate soil. It is the fastest, most efficient and cost-effective method of stone removal. The Turf Rake will cover more area faster, capture both large and small stone, and work well in both wet and dry soil. Unlike auger-type stone removers, the Turf Rake uses a grid of geometrically configured spring tines that rake through the soil and lift the unwanted stone and debris onto a conveyor, which deposits the stone/debris into a rear hopper/bucket. The Multi-Spike is a multi-functional tool that will give users a choice of five different tine options that will penetrate even in hard ground using the optional hydraulic weight transfer system. It is the ultimate root zone management tool for all surfaces and can work at depths from 0 to 8 inches at high working speeds. Unlike other aerification machines, the Multi-Spike can be used behind utility vehicles, small tractors and other prime movers. Broyhill's Legacy Sport® turf maintenance vehicle is designed to perform multi-functional tasks for turf and athletic field maintenance. Legacy Sport's AWD, 16-hp air-cooled engine and zero-turning radius provide ultimate maneuverability and speeds up to 12 mph. Standard features include low-profile fiberglass body, ergonomic seat with engine kill switch, headlight, 12-volt power source, improved hand controls location and exclusive wrap-around rear-hinged cargo box for operator accessibility while seated. Mid- and rear-hydraulic lifts accommodate a variety of attachments. Toro® Groundsmaster® 7200/7210 are zero-turn rotary mowers with powerful Kubota® 28-hp and 35-hp 3-cylinder liquid cooled diesel engines to get the job done. Durable heavy-duty 7-gauge welded deck construction with the industry's toughest spindle assembly. Use QAS attachments for tasks and convert from mow to snow removal with the patent-pending Polar TracTM System.